Image extracted from a 1912 edition of the National Geographic Magazine. 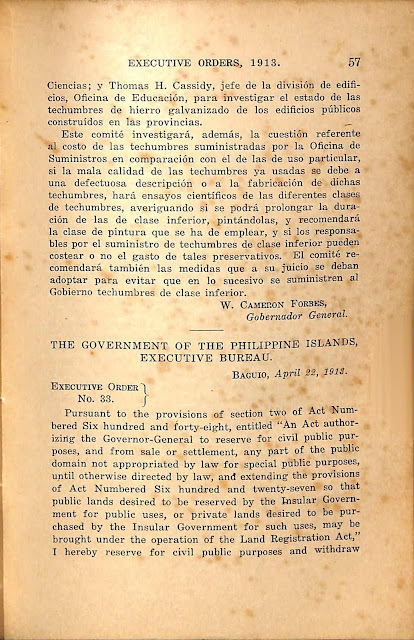 In 1913, by way of an executive order1, Governor-General W. Cameron Forbes reserved for civil public purposes and withdrew from sale or settlements all public domain lands within the Taal Volcano Island, also known contemporarily as the Main Crater Island of Taal Volcano in Taal Lake. 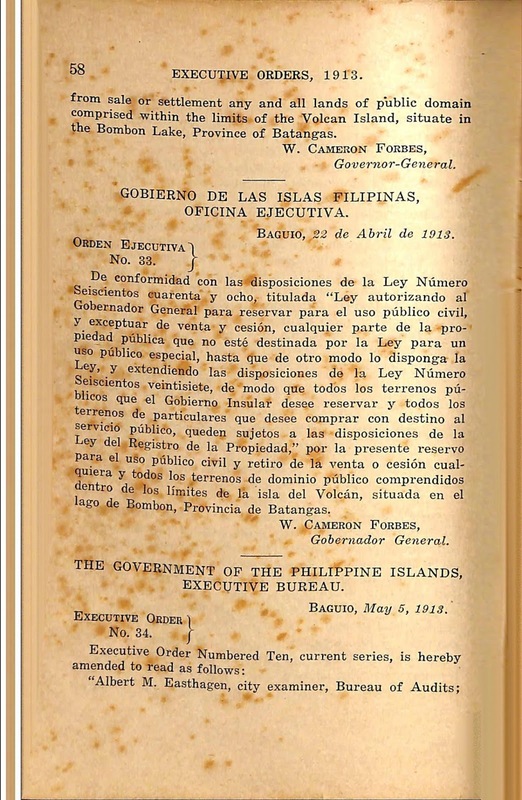 The contents of the executive order are provided below, with scans of the historic document provided in both English and Spanish underneath the text version. 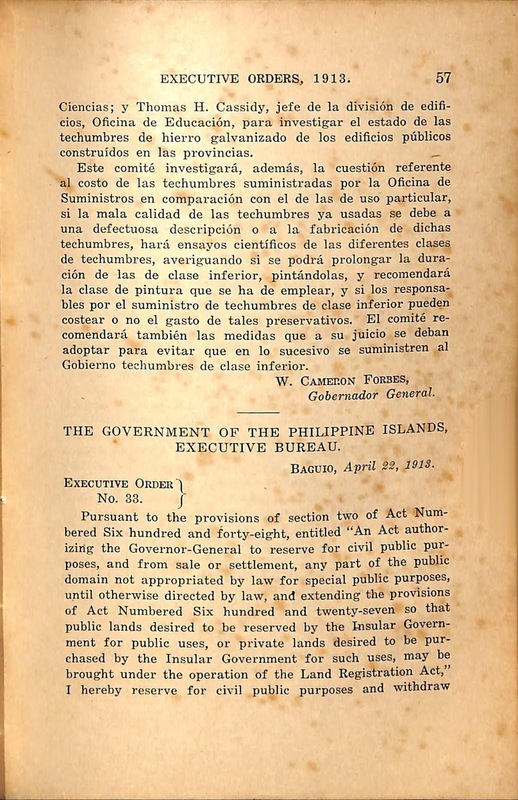 Pursuant to the provisions of section two of Act Numbered Six hundred and forty-eight, entitled “An Act authorizing the Governor-General to reserve for civil public purposes, and from sale or settlement, any part of the Public domain not appropriated by law for special public purposes, until otherwise directed by law, and extending the provisions of Act Numbered Six hundred and twenty-seven so that public lands desired to be reserved by the Insular Government for public uses, or private lands desired to be purchased by the Insular Government for such uses, may be brought under the operation of the Land Registration Act,” I hereby reserve for civil public purposes and withdraw from sale or settlement any and all lands of public domain comprised within the limits of the Volcan Island, situate in the Bombon Lake, Province 0f Batangas. Executive Order No. 33 series of 1913, English version. Executive Order No. 33 series of 1913, Spanish version. 1 “Executive Orders Nos. 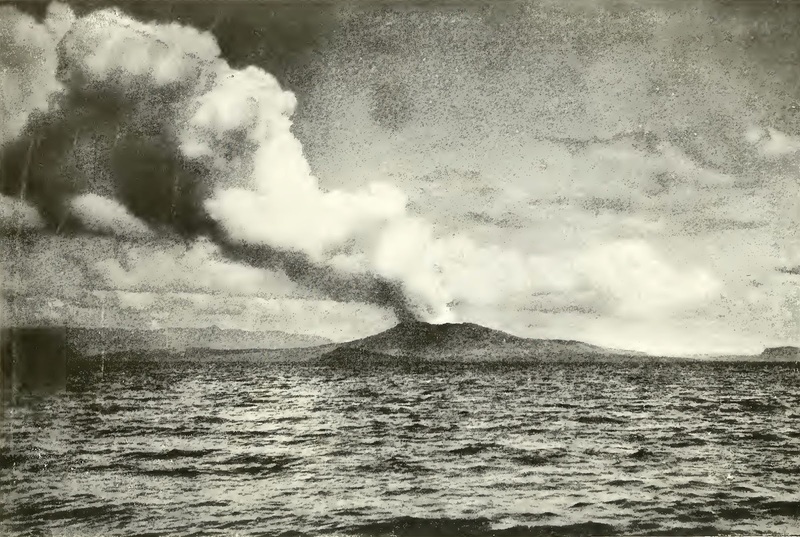 1- 111 (1913).” online at the Internet Archive.